Hospitality and tourism professionals in the UAE are bullish about the industry outlook for 2018-19 on the back of diverse concepts offered to tourists and businesses such as cultural tourism, entertainment parks and mega business events, industry executives said. "We are positive about the outlook for the UAE because the government and private sectors are forward thinking and continue to invest in new activities such as entertainment and theme parks, cultural tourism and developments for 2020. All this gives a positive outlook for the UAE. We are operating 20 properties now and will open 12 more in 3 to 5 years in the UAE," said Bastien Blanc, vice-president of operations, InterContinental Hotels Group (IHG). Blanc said both Dubai and Abu Dhabi are bringing in a lot of international tourists, especially with the addition of new cultural developments such as the Louvre Museum. "This diversifications is helping tourism grow. From the businesses perspective, Dubai remains one of the main cities in the world for hosting large conventional events such as the ATM which are bringing in thousands of visitors," he said. Blanc was speaking on the sidelines of the Arabian Travel Market 2018 which was inaugurated by Sheikh Maktoum bin Mohammed bin Rashid Al Maktoum, Deputy Ruler of Dubai and First Deputy Chairman of the Dubai Executive Council. 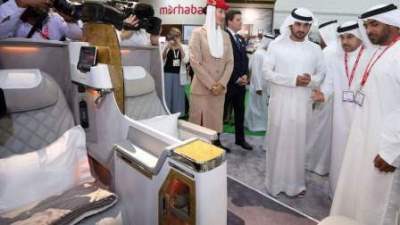 Over 2,500 exhibitors and 40,000 industry professionals from 150 countries are attending the 25th edition of ATM which will run for 4 days at the Dubai World Trade Centre. Olivier R. Harnisch, CEO, Emaar Hospitality Group, said the UAE, especially Dubai, is growing very fast, driven by markets such as China, India and Russia. He said the European travellers are coming back while the GCC market is still going strong. "The increasing attractiveness of Dubai is one of the key factors driving the UAE hospitality and tourism markets. The world-class infrastructure, Emirates and flydubai's increasing connectivity and the widening offerings such as the Dubai Opera and Louvre Museum are some of the factors driving the UAE's hospitality and tourism industries. Moreover, the cultural offerings are increasing beyond beaches and desert adventures. The UAE is becoming more mature with broad offerings. The UAE is attracting both leisure and businesses travellers," Emaar Hospitality's CEO said. According to the Department of Tourism and Commerce Marketing (DTCM), Dubai needs 40,000 additional hotel rooms in order to host mega event such as the Expo 2020 while the emirate's nearly 600 hotels and serviced apartments have an inventory of more than 100,000 hotel rooms. Consultancy STR Global revealed in January that Dubai has the highest number of hotel rooms under construction in the Middle East at 36,394 in January 2018. Figures released by BNC Network showed that out of 1,156 projects underway in the GCC by the end of March 2018, 524 were in progress in the UAE alone. While the value of hotels under construction in the GCC totalled $34.87 billion, $18 billion were being executed in the UAE. BNC Network has forecast that tenders for 48 hospitality projects worth $4.48 billion will be released in the GCC. In the UAE, tenders for 32 projects worth $6.1 billion will be floated this year. In 2017, Dubai attracted 15.8 million visitors, a growth of 6.2 per cent over the previous year. Around 73.8 per cent of tourists travelled to Dubai for leisure, with those visiting friends and relatives making up 13.9 per cent of the total, and business travellers accounting for 11.5 per cent. Laurent A. Voivenel, senior vice-president, operations and development for the Middle East, Africa and India for Swiss-Belhotel International, said trends for 2018-19 look extremely promising as the emirate's hospitality sector is forecast to experience sustained growth over the coming years. "The huge investments in airports and hotels, broadening portfolio of attractions and facilities, diversification of source markets and collaboration between various business sectors are all accelerating the pace of growth into the future," Voivenel said. Samir Hamadeh, general manager of Alpha Destination Management, expects to see continuous growth in tourism numbers from the UK, Russia, GCC and German markets. "Dubai is becoming a major attractions hub and is quickly maturing as a must-visit destination that one can return to over and over again. The recent addition of 17 new leisure attractions, initiatives taken by the private and public sector, strong year-round calendar of events and entertainment, world-class infrastructure and superb global connectivity further reinforces its position on the world map and are all steps in the direction to grow both new and repeat visitors," Hamadeh added.